Gas-powered water pumps are commonly found at job-sites and farms for irrigation purposes. With powerful engines in-tow, these pumps can move as much as 750 gallons of water per minute (GPM). If you need to move a lot of water, like a flooded basement, a gas-powered dewatering pump is exactly what you need. Typically, GPM is the number that will determine your purchase as this relates to how quickly a pump can get its job done. For occasional home use, you can get by with a 30 GPM pump, but for big jobs, you'll need something with more muscle. Important: Gas-powered pumps produce carbon monoxide emissions, they must be used outdoors. For pumping out a basement, you'll need a hose kit that allows you to place the pump outdoors while using a suction hose and strainer remotely. 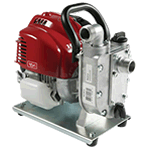 Water Pump Buyer's Guide - Find Out How to Pick the Perfect Water Pump. Our water pump how-to library can help you pick the perfect dewatering pump, submersible pump, trash pump or water pump accessory.